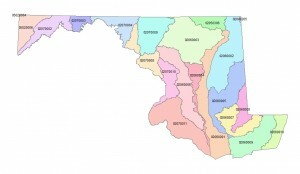 Twenty-four watersheds at the 8-Digit Hydrologic Unit Code (HUC) level are included or partially included in the State of Maryland. Investigate the watersheds and their properties by clicking on the map. NOTE: The clickable imagemap works as designed only on a large-screen device (desktop or laptop computer).